You know how some recipes adapt ingredients to make an overly heavy dish lighter and “healthier?” Maybe using cauliflower instead of potatoes, baking instead of frying? Well, this recipe is not it. This is authentic Brazilian cooking the way it was meant to be: substantial, loaded in carbs, and to make matters worse, breaded AND deep-fried. My advice? Enjoy it with a tropical smile, then go for a Spartan life-style for a couple of days. Totally worth it. This is the type of finger food that Brazilians grow up enjoying at parties and street markets. It originated in São Paulo, in the 19th century. It turns out that Imperial Princess Isabel had a son who loved to eat chicken, but he would only eat the thigh meat. One day, the cook ran out of chicken thighs and decided to shred the meat of chicken breasts, and hide it in a dough shaped as a drumstick. The boy loved it, and from then on coxinhas were a regular item in the Imperial kitchen. Imagine the thrill of that cook if he knew that 200 years later his creative recipe would be featured in a Bewitching Kitchen 6 thousand miles away! So, that brings me to the title of this post, “coxinha de galinha.” Sounds like two diminutives put together, right? Not so fast, dear students! The first part is indeed a diminutive. It derives from “coxa” (thigh), so coxinha is a small thigh. Now, moving to the second part: galinha… that is not a diminutive per se, it is a real word that means chicken. The word for rooster is “galo.” So, in Portuguese a male rooster gets a beautiful word, but the female is defined by its diminutive form. How sexist is that? Prepare the filling: In a large skillet, heat the olive oil over medium heat. Add the shallots and celery and cook, stirring occasionally, until soft and translucent. In a large bowl, place the finely shredded chicken and stir in the cooked onion and celery mixture, salt, pepper, red pepper flakes , the cream cheese, green onions, and cilantro. Set aside. It can be made a couple of days in advance, keep refrigerated. Prepare the coxinha dough: In a large, non-stick saucepan, place the chicken stock, salt, annatto or turmeric, and olive oil, and bring to a simmer over medium-low heat. When the stock is hot, add the sifted flour all at once while stirring very well. It will get more and more difficult to stir but continue to stir vigorously for about 1 minute or so until obtaining a uniformly lumpy dough. Remove from heat and transfer the coxinha dough to an electric mixer fitted with a hook attachment. Knead dough at low-speed for about 5 minutes or until it becomes soft and smooth. Scrape dough from mixing bowl onto a well-floured surface with a dough scraper or spatula, and knead a little bit more by hand. 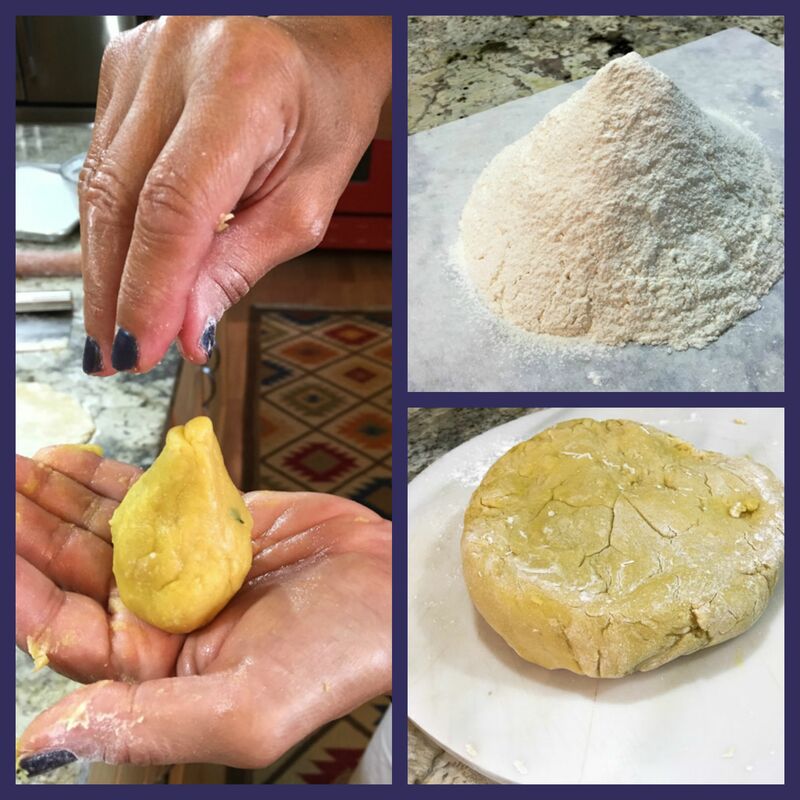 Shape the coxinha dough into a flat disk and let rest for 10 minutes at room temperature. Using a rolling-pin, roll out the dough onto a well-floured surface until it is about ¼ to ⅛-inch thick. Using a 3-1/4-inch round cookie cutter, cut out disks of dough and place them on a baking sheet lined with parchment paper (a metal spatula can be useful to help pry the disks from the rolling surface). Aggregate the dough leftovers, re-roll, and cut out more disks. You should have between 30 and 35 disks. Form the coxinhas: Scoop about 1 tablespoon of the chicken filling onto the center of each disk. Lightly oil your hands and shape the filled disks into drumsticks by folding the dough up and around the filling into a beggar’s purse shape, forming the neck of the coxinha between your encircled index finger and thumb, and gently press the filling down into the center as you close. Pinch and seal the edges. Pull the dough at the top out slightly so that it resembles a drumstick. Use a moist towel to clean your fingers off each time they touch the filling. Make sure the dough has no cracks; if it does crack, wet your fingers in water and pinch the dough together. Flatten the rounded bottom of the coxinhas very minimally with the palm of your hand (just enough that they will be able to rest upright), and placed shaped coxinhas on a baking sheet lined with parchment paper. Dredge and fry the coxinhas: Prepare three separate bowls for the all-purpose flour, eggs, and breadcrumbs. Pass the fritters through each bowl (flour, egg whites, and then breadcrumbs), shaking off any excess. Pour enough vegetable oil into a frying machine or heavy-bottomed pot. Heat to 350 degrees F. Fry the fritters in batches. Please, do not place too many coxinhas or chicken fritters in at the same time because this will lower the temperature, making the fritters oily. Make sure to turn all sides while frying the fritters so that they will brown evenly. Transfer coxinhas or fritters to a baking sheet lined with a double sheet of paper towels to absorb any excess oil. 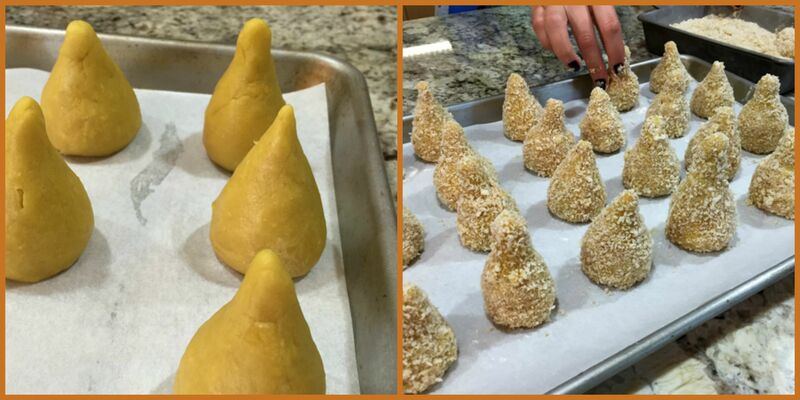 To serve coxinhas warm, keep the finished batches in a warm oven until serving. Comments: I won’t sugar coat the pill, this is a pretty involved culinary project. If you have a couple of friends to join in the fun it will be a lot easier. In that particular Sunday I had two friends over, Cindy, who has been a regular in our kitchen since the days we lived in Oklahoma, and Sheila who wanted to introduce Brazilian cuisine to her friends on campus. We made the full recipe, ending up with 33 coxinhas, more than enough for us to enjoy and share. Perfect! Shaping takes some practice, but even if you don’t hit it perfectly it will taste great, it’s all about the crunchy outside, the soft dough, and the flavorful meat inside. These are adorable and I luuurve the pronunciation guide! You are amazing! I’m pretty much into involved cooking projects, as you probably know, and just may do this in your honor! I’ve been waiting for the most complicated Brazilian recipe on your blog. Too bad I’ve already had you on SRC! Can’t wait to see your macaron post! So glad you enjoyed, Portuguese lesson included…. this is as complicated as Brazilian cooking gets, well, maybe acaraje’ could rival this one, I’ve never made it from scratch, now that’s something to consider too. Another deep fried delicacy, from Bahia. Oh, this is not good, I wish you could have heard the file – I wonder if there would be another format I could upload? Oh, well…. Ha ha! I’d better get revising!!! I LOVE this! I listened to the audio enough that I could move to Brazil and never starve. 🙂 I really enjoy recipes from childhood favorites but this also sounds delicious, even if I have to ride the exercise bike for 2 extra days. Great way to use leftover chicken (and other leftover meat), too. While you’re saying high in carb, they are also relatively protein rich with all those eggs. I’m assuming these are better hot than cold? Would make great canapes, too! Yes, they are better hot – leftovers heat well in a low oven. However, in parties, once you get a big tray out, with them still hot, people will go on eating them at room temperature, no real loss in flavor. But definitely better hot…. I am with you on this… in fact, I was trying to remember when was the last time I deep fried anything before making coxinhas, and I think it’s been over 1 year, probably a lot longer. I just don’t care for the smell, and then having to deal with the leftover oil etc etc. But, every once in a blue moon I face it. In this particular recipe, there is no way around it because baking would not work, the dumpling part is too thick, it needs the frying step to cook through. Sometimes you just have to bite the bullet and fry. 🙂 I recently made 3 dozen egg rolls … delicious but I now have a jar of strained oil in my fridge … and a lot of very tasty egg rolls in my freezer. “…well, this is not it” Haha, love!! Sometimes, it’s all about the real deal. These sound so intriguing and they look amazing too (the shape reminds me of giant kisses 😉 ). I’ve got a huge tropical smile on my face though it’s no match for Sheila’s. Fabulous Sally! Yes, indeed… Sheila’s smile lightens up any room, don’t you think? and it’s true, they look like giant kisses! Had not noticed until your super accurate sense of observation kicked in…. Merci bien! I did some Spartan this past couple of days, will continue today, so I can dive into a serious chocolate cake tomorrow morning… life is all about balance. Which makes me think that I’m getting better at my nemesis yoga posture… not quite there yet, but I made some progress… even Phil notices. Hope? you’d think? I have no doubt! You’ll get it soon I bet! You should see the one Miss A is pulling off now! Her yoga teacher loves teaching her new poses. Now she’s teaching me! Hi, Sally! 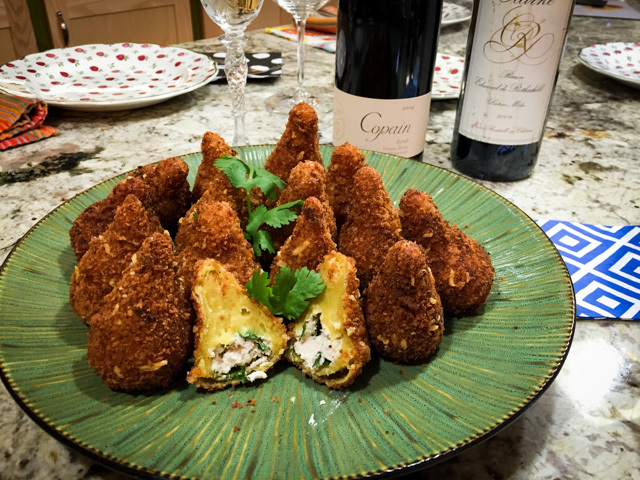 Thank you for the link… I hope you guys have enjoyed these coxinhas. My hubby is crazy for them — bummer that I don’t have much time anymore to make them often. Perhaps I will visit you one day and we can savour some coxinhas together. Have a delicious weekend! It was super involved, but worth it… everyone loved them! I wish I had some Catupiry to place in the middle, can you imagine how wonderful they would be? thanks for the recipe inspiration!